The Indian wedding season is approaching and if you’re shopping for trendy bridal lehengas, we have done our homework and got the best designs for you!! Every Bride desires and dreams to look perfect on her big day. Brides tend to desire designs that are different and unique, as it’s every girl’s dream to look elegant on her Wedding day. There is beautiful collection of Sarees, Lehangas and Gowns available for this wedding season. Let’s look what is in trend for 2016 Bridal Collections! Work– Embroidery or Embellishments? The latest styles have crystal, dabka, dori, gota, zardozi, mirror work, patchwork and brocade. What Colors? The trendiest colors for 2016 are wine, red ombre, blush fuchsia, Orange, gold, classic red, rose pink and champagne are also popular. What Fabrics?The latest fabrics for wedding lehengas are silk and raw silk, net, brocade, satin, velvet and crepe. Velvet and silk are popular for cholis, and net and georgette for duppattas. For the Bride-to-be: The days of the demure bride are long gone, and now every bride dresses to be the center of attention! And why not, it’s her day after all! Sangeet, engagements and cocktail parties call for beautiful gowns in a color that you wouldn’t wear on your wedding day. So choose green, peach, blue, purple or whatever you like the best with subtle embroidery on the top (so you get great pictures!). For the Bride’s or Groom’s Mother:The bride’s mother is a busy woman, any day of the wedding week! So choose something that lets you walk around and greet the guests without fidgeting. Like kurta lehenga which looks very elegant! 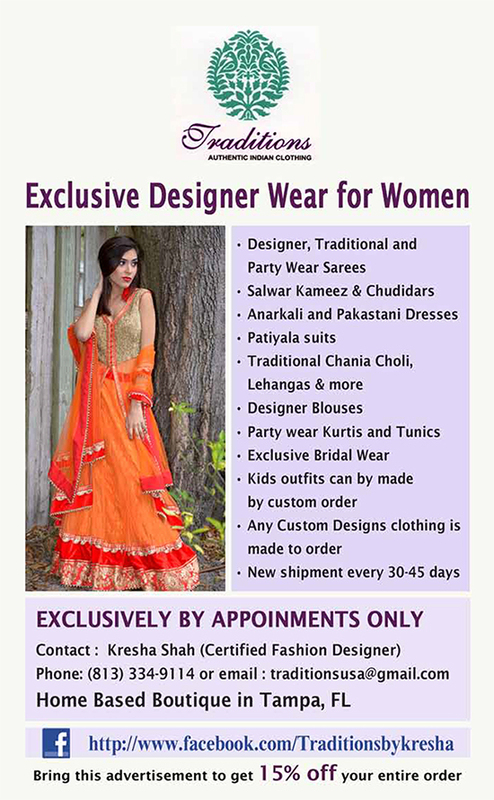 For the Bride’s Sister: Lehengas, gowns, anarkali, all work well for the bride’s sister. For 2016, gota, sequin and threadwork are great choices. Choose the latest cuts and styles like tassels, belts, layered skirts and slits! For the Groom’s Sister:The groom’s sister or sister-in-law is probably the happiest person around! So if you’re it, wear something that lets you dance a lot while looking great! Go for a gown or a beautiful lehenga with crop top in a bright color! For the Bride’s Friends: Wear easy and comfortable clothes, but choose experimental and latest styles that suit your body type (for great pictures) and comfort (for all the dancing)! Good options are ankle-length cocktail dresses, palazzo or Aladdin pants, long skirts and chudidars! Designers Kresha Shah and Shalvi Shah are certified fashion designers and in the fashion industry from last 16 years. They can guide you and design any occasion outfits for you. Check out all the latest trends at Traditions Boutique, Located in Tampa, Florida.